Azimo is the world’s largest online-only money transfer company. Their state-of-the-art service lets you send money any time you like to over 190 countries through your phone, tablet, laptop or PC. 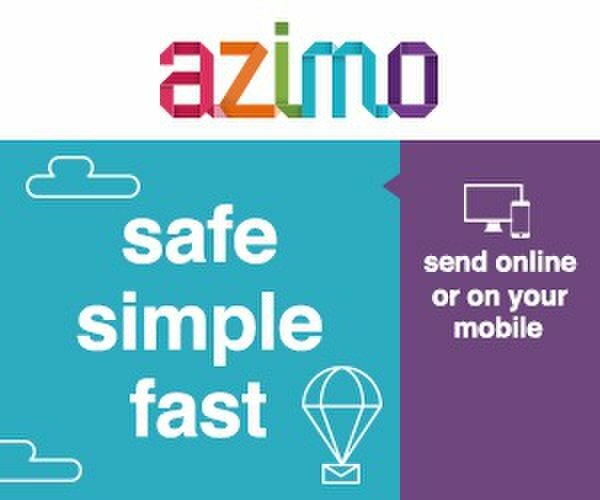 Azimo’s fast, simple, three-step process transfers money direct to a bank accout, for cash pick-up or even home delivery. Why trust Azimo with your money? Azimo is fully regulated by the relevant financial authorities and has the same 128-bit security systems as the banks. So when you trust Azimo with your money, you can be certain that it will reach its destination, quickly and securely. Thanks to their online network, Azimo can be up to 80% cheaper than sending money with Western Union or Moneygram and up to 90% cheaper than high street banks. On top of all this the exchange rates they offer are outstanding, making your whole transfer exceptionally good value-for-money. Find out more and visit the website today!